Here is a small article about the latest improvements in Azendoo, including a new way to see your subtasks directly from your task lists, a new desktop application and a faster way to manage task subscribers. 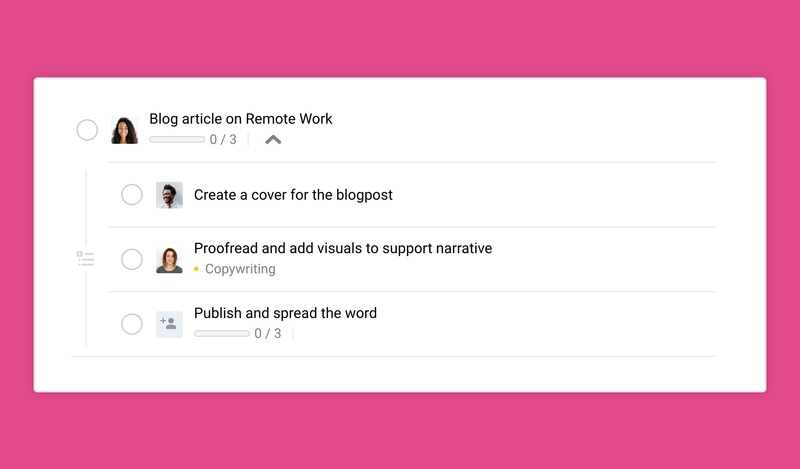 We are thrilled to announce that you can now view your subtasks directly from any task list. Every task containing subtasks will have a new toggle icon under their label. Clicking on this icon will display its subtasks below. This enables you to quickly see which subtasks remain to be done without opening each task individually. Click again to hide the subtasks. You can interact with your subtasks as you would with any other tasks and mark them as done, assign them, click to open them and start tracking time on each subtask. Note that only one level of subtasks is displayed at once. We improved the desktop applications on Windows and MacOs, and released our first Linux version. There are some breaking changes which means that you need to update your apps manually. Download the latest versions here for an improved desktop experience. We redefined the way you add subscribers to your tasks, saving you tons of clicks. You can now add multiple collaborators much faster. Removing subscribers is also much faster thanks to the new icon appearing when you hover your cursor on an avatar. Please reach out if you have any feedback and let us know how you feel about this update!